The Fullerton College Athletic Department recognized former teacher, athletic trainer and mentor Bill Chambers for his 38 years of dedication to Fullerton College and his contributions to the Athletic Training profession. 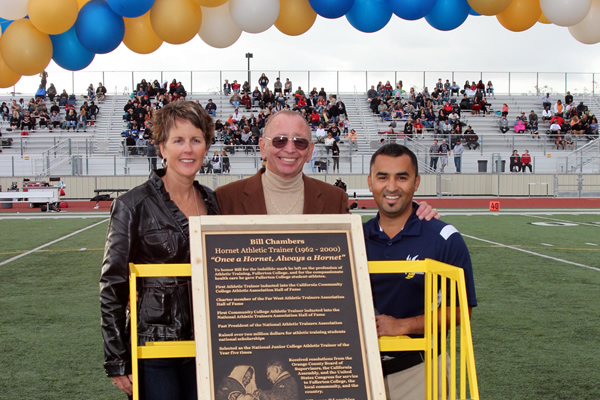 Bill was honored on Saturday, November 16, 2013 at 1:00 pm during halftime of the 91st “Key to the County” football game vs. Santa Ana College by naming the athletic training room after him. During the event a bronze plaque with Bill’s likeness was be presented to him and later placed on the outside of the athletic training room in the 1200 building. The Fullerton College Athletic Department sought donations to help cover the cost of the plaque and other memorabilia that will be hung in the athletic training room. 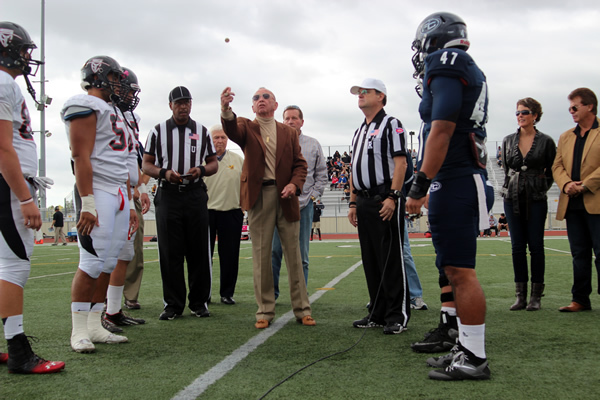 The game started off with Bill conducting the opening coin toss with a vintage coin used by the [then] Big 8 Officials. The coin was given to Bill after it was used for the toss at the 1962 Oklahoma vs. Missouri game. Bill retired in 2000 and is still regarded as a legend by those in the field of athletic training and sports medicine. He has served as president/director of many organizations related to athletic training/sports medicine such as Mobile Sports Medicine Systems (a company serving professional rodeo, Indy Car racing, and NASCAR) as well as NATA itself.